Beware: DalmyDoDat / SpotmyTots / Fursace / Mäul. [Resolved] - "Artists Beware"
This happened almost 2 years ago, so some of my memories are a bit fuzzy but I will do my best to recount everything that happened. The most recent issues were recent. This is my first time posting an artists beware. After everything was all paid I eagerly awaited the delivery to my friend. But soon, again almost two months later, there was a new email that arrived that said there would be shipping delays due to a convention & illness. 5 Of course, that doesn't bother me, as I understand real life happens. In the email it was stated that orders would get filled after the convention so I didn't mind the extra wait. Soon time passed and it's been another 2 months since the shipping delays email and I find out my friend moved and needed it to be sent to another location. So I emailed Dalmy to try and get it updated and never recieved a response. 6 Then again, 2 months after that I tried once more to see if it was all set, but I again, never recieved a response or confirmation. At this point it's been 8 months since the initial order. About a month later another new email arrives talking about how people were getting frustrated with their orders not arriving and filing disputes. 7 One thing that struck me right away was that apparently their Paypal is now frozen because of the disputes that got filed. There was also promise of them getting out to the new year. At this point, I was satisfied and assumed that the deadline would get reached this time and everything would work out well. It was at this point, on the same day, I emailed Dalmy on the email that sent the previous message and again let them know that my friend had a new shipping address and I wanted to make sure it got noted/updated. 8 I recieved no reply. 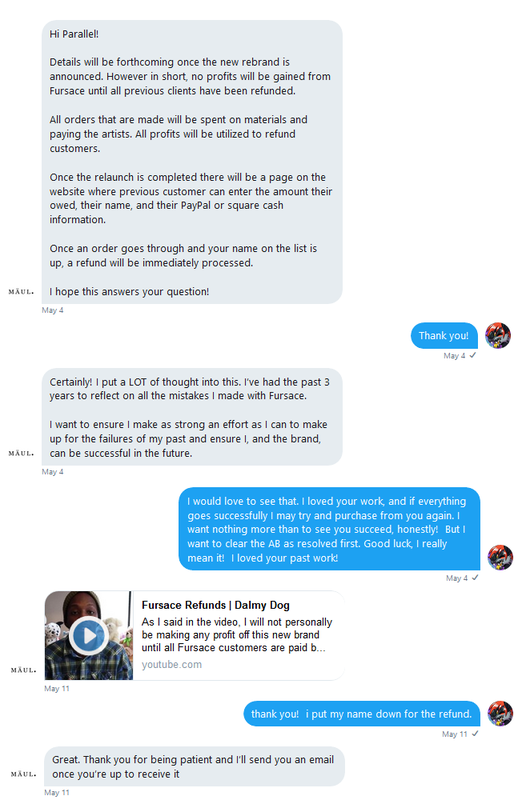 On April, in 2016, there was a single twitter post on the Fursace's twitter detailing that there will be promises of a video detailing refunds. 9 Nothing ever got made. After waiting a few more months I started to ask for a refund, due to the lack of results. My friend had not recieved anything, and emails and communication had ceased entirely. At this point it was October 2016, it has been 1 year and 7 months since ordering. 10 But then I started to get mail returns on one of the email addresses. 11 I did not get any response. I continued to ask on their personal twitter what the status of the refund video was, and eventually started to not get any replies at all. 12 Their twitter continued to be active. And I decided to DM their buisness twitter to see if I could get any results. 16 I did not get a response at this point. I sent another email (and a few of the addresses got rejected and mail returned again). At this point I was very frustrated, and it had almost been 2 years at that point. So I mentioned about going to post on Artists_Beware. 13 I did not recieve a response. There has been no further correspondence from Dalmy. I did try at one point to file a dispute on Paypal, but because their paypal was closed from all the other disputes and also it had been about a year and a half since purchase, they rejected my claim. At this point I just want my full $40 refund and to move on. EDITED 5/20/18: Dalmy has changed the name of Fursace to be "Mäul./Maul". The refund video. I was linked the video and applied right away on 05/11/18 (which was confirmed by email on 05/18/18 by Maul/Dalmy/Fursace to get a refund (I had done it previously on 02/22/17). The twitter conversation for the refund: X. The email confirmations for the refund being sent: X. And the refund being recieved: X. The link to apply for refunds for previous Fursace customers was listed on the website. I would like this marked as resolved. The new company name should be added in the tags, maybe, so people seeking refunds can locate them if possible. There are people still seeking refunds. As a heads up, he's refunding folks. Feel free to see here.